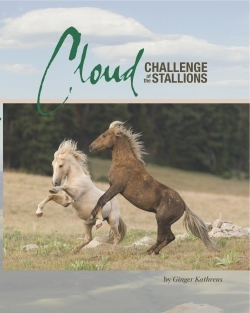 Even without having seen her PBS Nature documentaries chronicling the wild horses of Montana’s Arrowhead Mountains, readers will appreciate Ginger Kathrens’ heartfelt book, Cloud: Challenge of the Stallions. The oversized book is part visually compelling photographic sojourn, part gripping wildlife saga, and part emotional journey into the heart of wild horse society. It would look good on any coffee table, but the bonus is to dive into the text, landing deep in the machinations that drive the herd and its subgroups. Cloud is the pale palomino stallion Kathrens has followed since his birth. Here he is already a rising band stallion, controlling a family band of breeding mares and their foals, plus the young fillies and colts who will leave him eventually, lured–or stolen–by other stallions who are likely also somehow related. An acclaimed wildlife photographer and Emmy-winning filmmaker, Kathrens doesn’t bog down her text with minutiae about camera lenses and shooting angles, but tells the horses’ life stories through her own human eye–and heart. On frequent trips to the Arrowheads, the author brings readers to quiet perches amidst deer, bear and other wildlife, on hikes, drives and horseback treks–as she observes and notes the sometimes tumultuous shifts in band loyalty. Hundreds of lush photos are awash in natural light and shadows, spanning five calendar seasons. Both photos and text reveal true animals in their wildness–brutal, loving, pragmatic, tough, vulnerable, unpredictable. Stallions who once romped together engage in powerful ritual sparring to win over mares. Bites and kicks draw real blood and usually, heal. Robust, adorable foals get gobbled by mountain lions (though thankfully, off camera), while sickly newborns pack on pounds and thrive. A tangential yet integral thread to the story traces ill-conceived Bureau of Land Management attempts to manage herd fertility, which the herds and nature were already quite well-equipped to address via a centuries-old predator-prey regimen and instinctual methods of population control. Instead, their interference renders mares barren and forces others to give birth out of season. Lifelong riders can learn something here about how horses were meant to live and communicate. The author even notes, “The complexity of wild horse society continually surprises me.” Others who simply like horses or wildlife may garner new appreciation for wild horses, an American treasure that’s threatened and dwindling daily. A glossary, family tree listing, and preservation resources are helpful additions. Proceeds from the book benefit a foundation to preserve wild horses on their home ranges.